Image after Petr Exner's Vexilologický Lexikon prapory obcí ČR (2002) - Litultovice, Opava district, Moravosilesian region - adopted 3 Apr 2002. Number of inhabitants by 31.12. 2000: 750. The village was mentioned first in 1224. 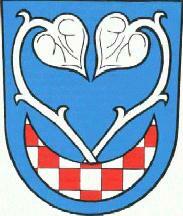 At the time, the village was a feud of the Episcopate of Olomouc. In 1582 the village burnt down. Sooner the village was a market town. Later on the village became a central village.